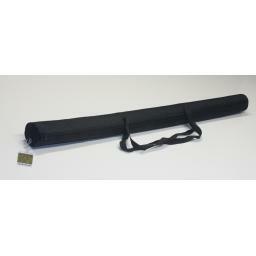 These mats are extremely durable, printed on a water resistant surface affixed to a neoprene backing. 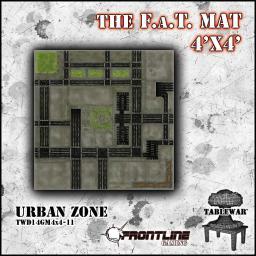 That means the mat won’t slide around on the table, lays flat, resists water and looks amazing. 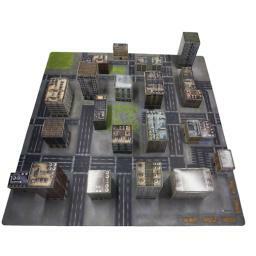 This mat was designed with Hawk to make a fantastic playing surface for your DzC games! I'll get at least one as soon as they are available in europe. Awesome! They will be available in the UK in the next few weeks, actually. Is there going to be a 6 x 4 version? -its basically a huge mouse pad (so much so that I put it upside down and told my friend i got a 4x4ft mouse pad) it doesn't slide and is water resistant, wont tear easily. 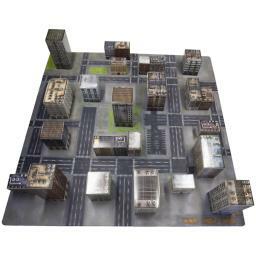 -looks good and has a fair amount of detail (and unlike the cityscape/ruinscape tiles, it is matte so that pictures can be taken at steep angles without the shine). 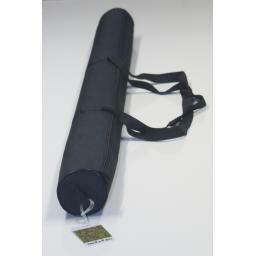 -easy to roll up and take with you places. -the bag is handy and a nice addition. -the standard buildings don't fully cover up the park tiles or the parking lots like they mentioned in the video on the frontline gaming website. -A little "too clean" for 200+ years of warfare for my taste. more to come in a real review. if you have any questions or want me to take a specific picture of the mat let me know. I'd also be interested in a x4 version as well. 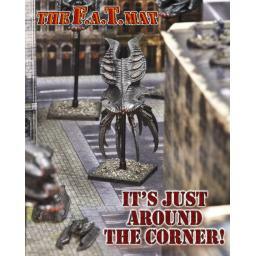 So I ordered one of these mats through my LGS (Go4Games) about 5 weeks ago. According to the LGS they've had problems getting them shipped and even after shipping, it's taken like 2 weeks. I still don't have my mat. Not sure if this is an LGS problem or a manufacturer problem. Also, there never was an answer to my question if there is going to be a 6x4 version. I get that they're probably a small company but a licensed product should have 'some' representation about it, shouldn't it? they do have a UK distribution agent, I will send them an email and find out exactly who it is! These look cool, I'll pick one up when I see them in a UK store.